“Tet at the Heritage Site” is taking place until February 11 at the Hoi An Impression Theme Park in Hoi An ancient town, a World Heritage Site in the central province of Quang Nam. To mark the upcoming Lunar New Year (Tet), the park features five spaces representing traditional craft villages in the province. Visitors can have a new experience admiring bronze products from the Phuoc Kieu village, conical hat and wooden product making from Kim Bong village, boat racing from Thanh Nam village, lantern-making from Hoi An, and ceramic products from Thanh Ha village. There is also a cuisine corner with street specialties from Hoi An and lessons on how to make “Banh Chung” (Chung cake) - a traditional Tet treat. Visitors can also enjoy “Bai Choi” folk singing and folk games. At 5pm every day, a dance show entitled “Hoi An World” re-enacts scenes from the old port of Hoi An during times long gone. Meanwhile, a colorful musical show - Hoi An Memories - takes place between 7.30pm and 8.40 pm. Featuring a cast of nearly 500 actors on a 25,000 sq m stage spanning the Hoai River, the show recalls memories of Hoi An as a prosperous trading port over 400 years ago. The 10-ha theme park includes indoor and outdoor theaters and shopping and entertainment complexes. With free entry, the park also present visitors to the show with gifts to celebrate Tet. 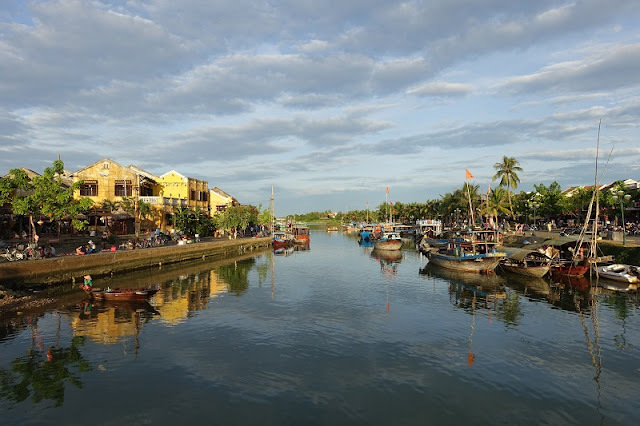 Located in central Quang Nam province, Hoi An was a leading trading port in Southeast Asia in the 17th and 18th centuries. Its architecture is a combination of Vietnamese, Japanese and Chinese, with a little Western as well. It became a UNESCO World Cultural Heritage Site in 1999. The city’s Hoai River and its channels made the list of the ten most famous canals in the world on the US-based travel website touropia.com in 2014.